Virtual reality provides you with an artificial environment in such a manner that the user suspends belief and accepts it as a real environment. VR has already headed towards transforming the future, and entertainment industry is one of the most enthusiastic advocates of virtual reality is expanding at its own pace, often built on bringing the impossible to life. Recently Cartoon Saloon has given us an opportunity to step inside the Great Storyteller's Cavern inspired by their Oscar-nominated hand-drawn animated feature film ‘Song of the Sea', directed by Tomm Moore. The movie is about selkie and how the fate of all the fairies is connected to her and the turn of events sets her off on a journey full of challenges and adventures. The whole movie is hand animated which makes it look more beautiful and appealing, though being a long process as each second of footage requires twelve drawings per character. The movie now invites you for VR experience through Gear VR and Rift. It supports 360° front facing tracking mode and is supported by Oculus Touch for Rift. The recommended graphics card configuration includes NVIDIA GTX 970 / AMD 290 equivalent or greater for Rift. The difference in both Gear VR and Rift in terms of required space is that former requires of 504.08 MB whereas later of 1.69 GB. 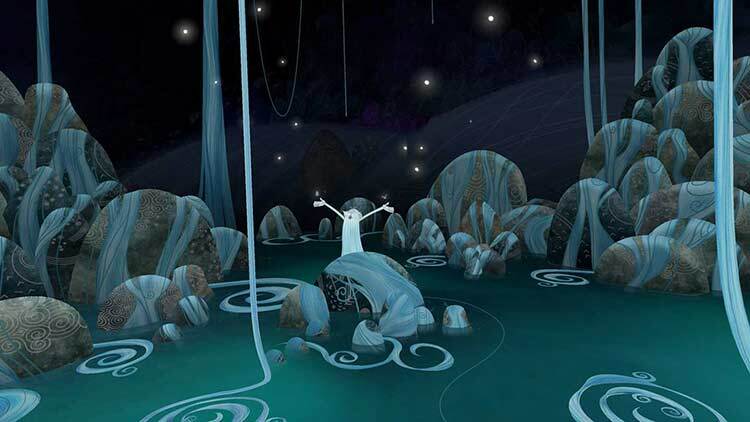 The exclusive VR experience is a collaboration between Oculus and Cartoon Saloon, with Norlum and VR Specialists Vision3. The experience is expected to be free for all the users and claims to bring hours of fun.